The Salem College Rotaract Club has been awarded the Presidential Citation Award for their excellence and distinction during the 2013-2014 academic year, exhibiting leadership, service, and collaboration with the Winston-Salem Rotary Club. 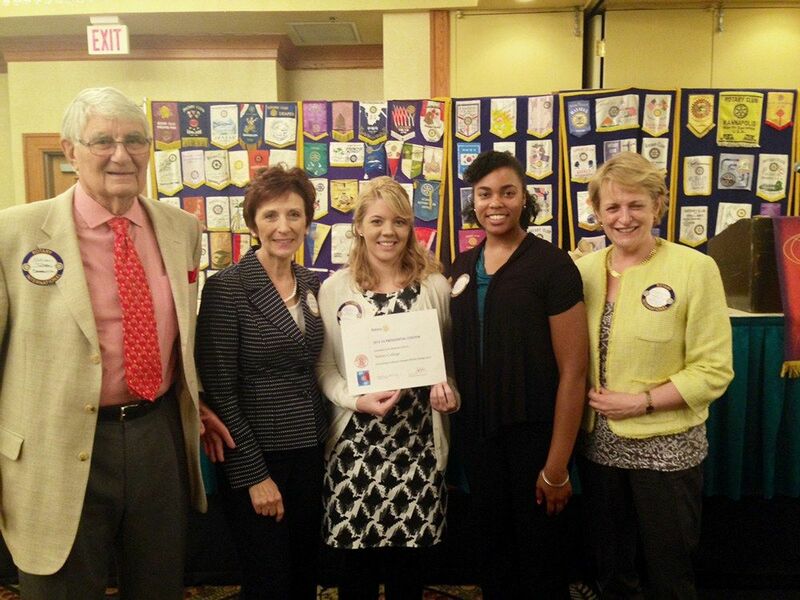 Presented at a Rotary Club luncheon on September 9, Salem senior Megan Taylor, past Rotaract Club president, accepted the award. Last year, there were 20 active members of Salem’s Rotaract Club, volunteered on campus and in the community in numerous capacities. Members assisted in a book drive for Brenner Children's Hospital, tutored children at Ward Elementary School, trick-or-treated for Second Harvest Food Bank, filled Operation Christmas Child shoeboxes, volunteered with local chapters of the Salvation Army and Samaritan Ministries, and represented Salem at the Color Run and the Hospice Hope Run. In January 2014, for Salem College’s inaugural year of participation in the Martin Luther King Jr. Day of Service, Rotaract collaborated with Change This World– an organization dedicated to feeding the hungry in developing countries. More than 20 volunteers helped to assemble and pack 3,000 meals. Over spring break, members from Rotaract traveled on a mission trip to the Dominican Republic, facilitating workshops, serving in clinics, and rebuilding homes. Rotary Club member Marty Edwards, the liaison between Rotaract and Rotary, presented the Presidential Citation Award on behalf of Rotary’s district governor Kathryn Billings. Salem College President Lorraine Sterritt and Dean of Students Krispin Barr were also in attendance.